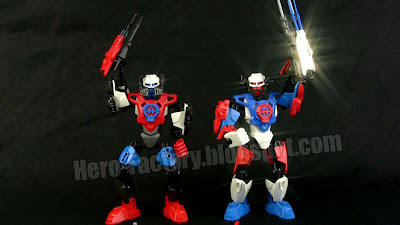 I made these patriotic Hero Factory MOCs about a month ago, but didn't get a chance to post them up due to a tremendous backlog of work for other (non-LEGO) sites & YouTube channels of mine. I'm finally starting to get caught up, and I'm happy to be able to unleash these two basic heroes as a July 4th tribute to the American soldier and victories against evil foes. Now where are those Savage Planet sets?! Can We hear more about the actual heroes? I would like to see their hero bios. wow. U.S.A all the way. i don't no why i am saying that because i live in england! Well LEGOJANG you pulled it off agein! not to well color scheme but great mocs. hey I saw your video hero factory moc tip: make "2.0" head with no visor and to make it fit perfectly aligned you just use a nail file and file it a litle bit and tada! try it. hey, july 5 @ 11:31 AM, use a lego agents series minifigure pistol to attach helmets without visors. you don't have to wreck anything to align it properly! WHO HAS A HEROFACTORY 3.0 YET COZ THEY'RE SCHEDUELD FOR 1ST AUGUST NOW! JANG, I hear the Savage Planet sets are in Toys R Us. is this a battlefield theme song? I do! I got Rocka, Witch Doctor, and Raw Jaw! Very, very nice (as usual). Quick question, will you be making a Rocka 2.0 to go with the comic depiction? Hey JANG do you have any 3.0's yet because alot of my friends in America have them and if you do can you please review rocka 3.0 first??? Oh and jang YOU ARE FREAKIN AWESOME!!!!! Actually for all the Anonymouses who were talking about the eye alignment with no visor on a Hero head, I have independently discovered that the BEST method is to take a minifig magnifying glass, insert it in the front slot so the magnifying glass(round part) is right behind the chin. Then put the skullcap on. WORKS PERFECTLY. I actually came up with names for the heroes and the villain.